Pimp My Zimmer project 'reduces falls' Jump to media player Care home residents in Wales have been decorating their Zimmer frames to make them more identifiable. Woman, 98, plays donkey in nativity play Jump to media player A 98-year-old woman is playing the donkey in her first nativity play in Castleford. Child cancer survivor fights for better treatment Jump to media player Vicky Forster beat leukaemia as a child. Now she works as a scientist, trying to change the lives of children with the same disease. GPS devices for people with dementia Jump to media player Sussex Police has become the first force in Britain to pay for GPS tracking to help people with dementia. How to make a home dementia-friendly Jump to media player Simple design changes can help people with dementia stay in their homes for longer, according to research by the University of Stirling. Care home residents in Wales have been decorating their Zimmer frames, with help from local schoolchildren. The Pimp My Zimmer project aims to reduce falls after a care home matron noticed people with dementia sometimes find it hard to recognise their own frame. 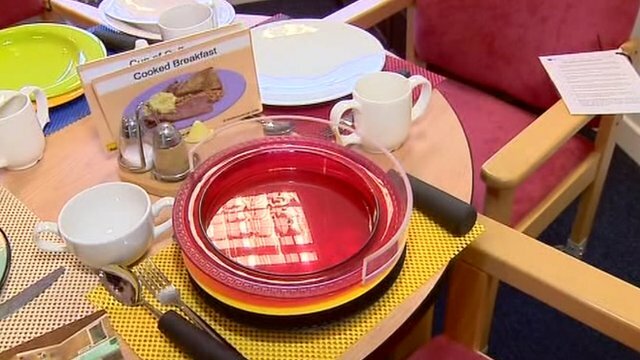 One care home claims the project has reduced falls by up to 60%. Listen to Health Check on BBC World Service.